Fine dining in Perth…well, I had tried to get into the renown Jackson’s, but Da Boyfriend won’t do a degustation, so we were running out of options, particularly as we were relying on people we came across for recommendations. 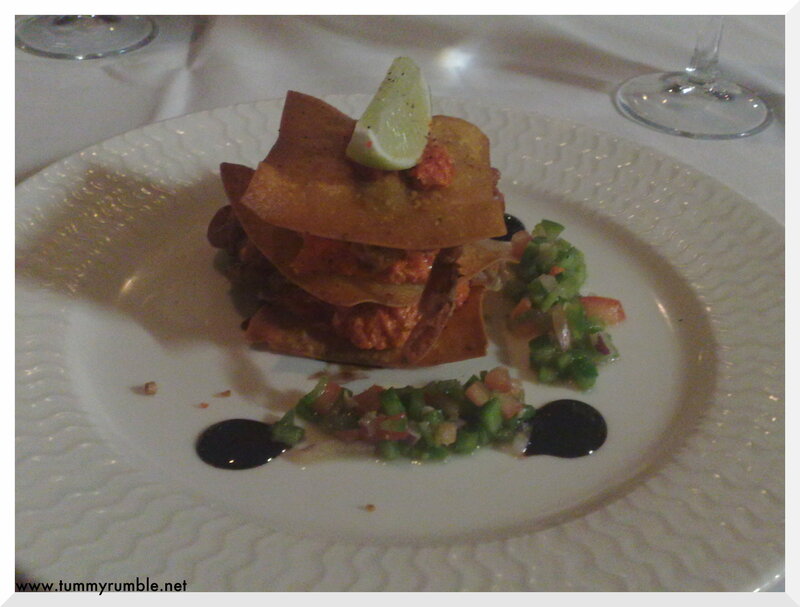 One of the recommendations we were given was for C Restaurant. First things’ first: It revolves. Yes, a revolving restaurant on top of a building! 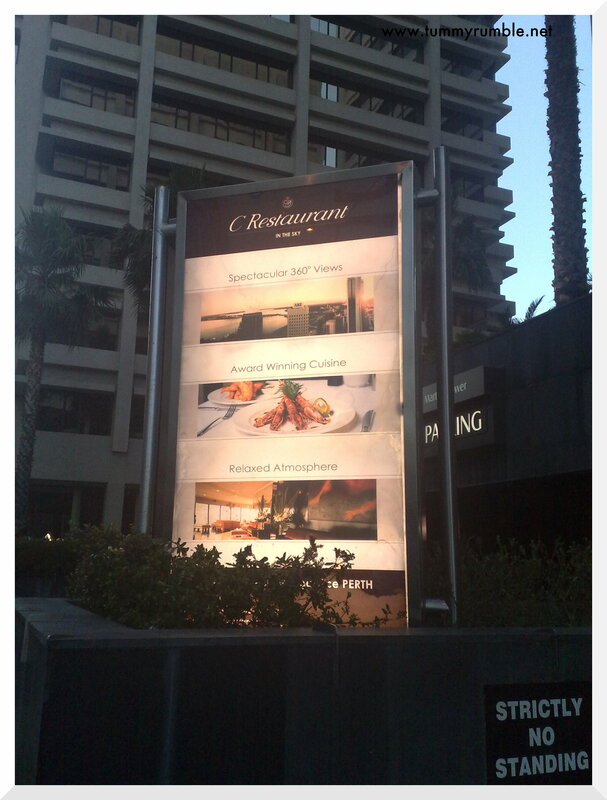 So we made our reservation for our last night in Perth. Now, before I go any further, there is one more Perth post of my favourite place that we went to,so I’m saving the best for last! 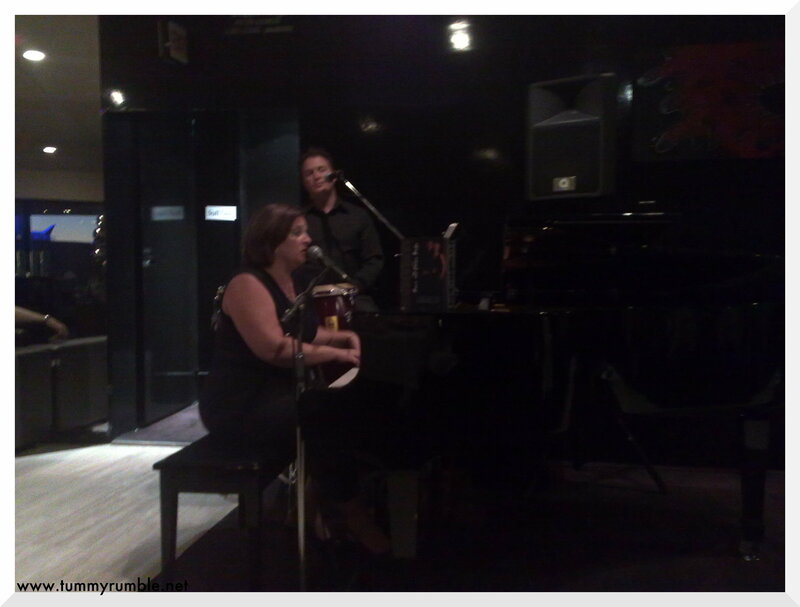 We headed to the restaurant through the deserted CBD at the appointed hour and made our way, with some fairly dressed up couples, up 32 floors to level 33 (doesn’t quite have the same ring as 41, hmmm?). The restaurant is divided into the bar, and two levels of seating. We were relieved when we were seated in a booth rather than the tables which seemed more exposed. The views were spectacular. Perth is truly a beautiful city. Unfortunately, when you passed by it was too loud to hear your dinner companion speak! When I called to make the reservation I was informed that there was a strict dress code, and that dinner was $75 for two courses, so Da Boyfriend was suitably concerned in his jeans and sneakers whether we would be let in. Nothing to worry about however, the standard was mixed with most very dressed up, but relaxed, befitting Perth’s laid back vibe. Chilled mango salsa type thing going on..it was tasty and I could’ve happily had more of whatever it was! The soft shell crab was very generous, and super tasty with a tangy capsicum sauce throughout. But due to the crunchiness of the layers and difficulty knifing it, it was hard to eat elegantly. 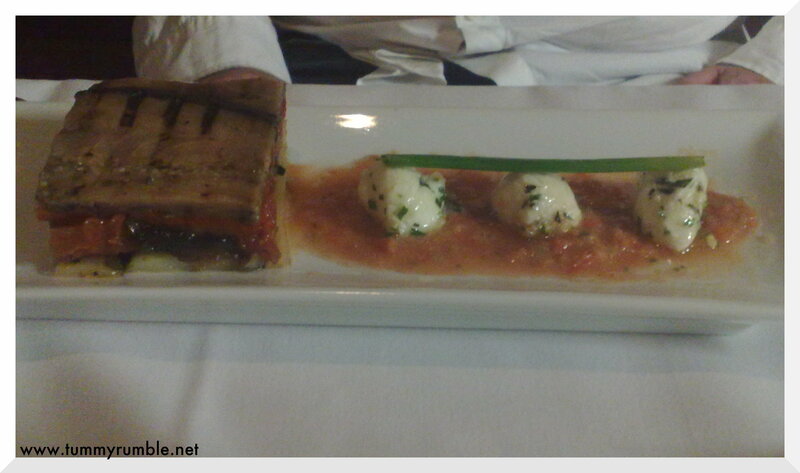 Surprisingly, the terrine was also difficult to eat as it slid around the plate, but was happily consumed. On to mains, and the second of our courses, I had the lamb and Da Boyfriend had of course, the beef fillet. 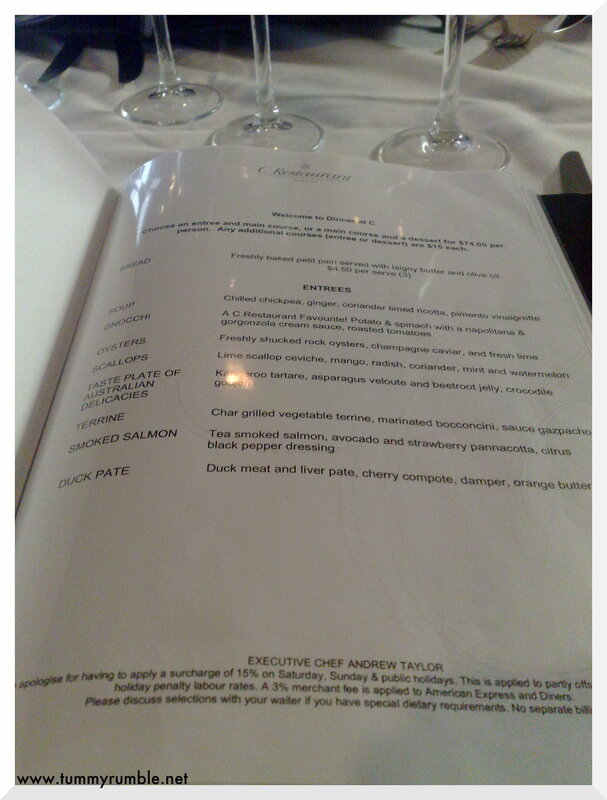 He would have had the wagyu, but as you can see from the menu above, it attracted a $40 SURCHARGE. Unfortunately I didn’t get a decent shot of the beef as the restaurant was quite dark in order to make the most of the view. The lamb was beautifully cooked and very succulent, but I didn’t manage to get quite enough meaty goodness when I attempted to separate it from it’s bony home. The beetroot and sesame puree was bland and needed lot’s of salt, while the apple and celery omelette was good, but had obviously been cooked earlier in the day and reheated for plating. Boyfriend’s beef far outshone the lamb. 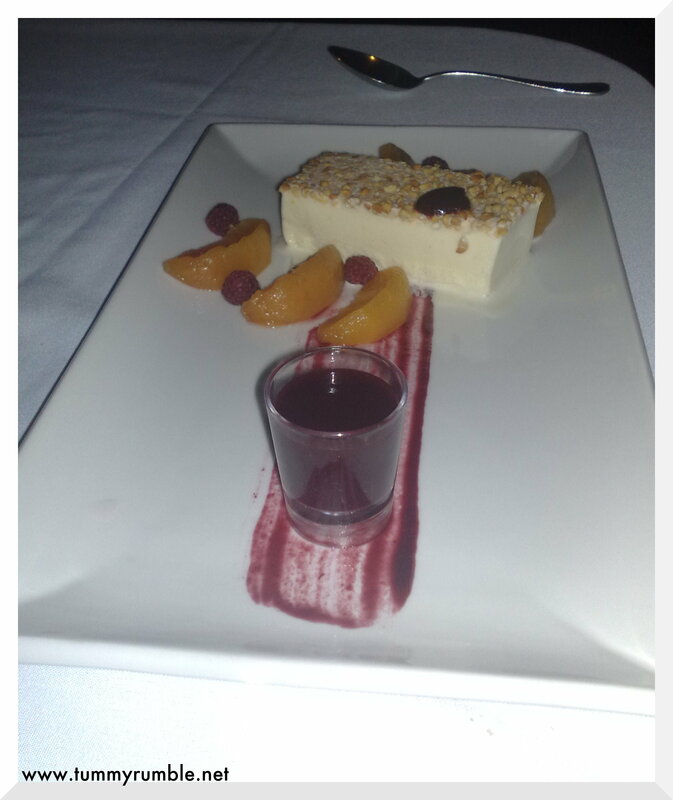 For an extra $15 we could order an additional entree or dessert, and by this stage dessert was looking pretty good. A note on the service. 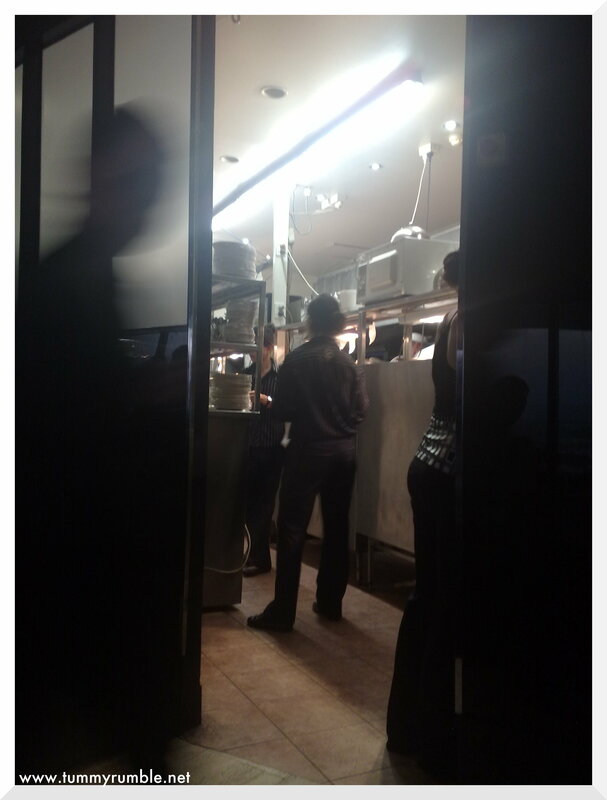 It must be difficult for waitstaff to work in a restaurant where the tables are constantly moving. All three courses were mistakenly delivered to another table, one or two behind us, a situation not helped by the fact that very few of the staff understood English. None bar one of the waitstaff came across as particularly polished or professional. Surprising for a restaurant that posits itself at this end of the scale. Something you may have noticed on the menu images was the note at the bottom detailing the 15% surcharge. “We apologise for having to apply a surcharge of 15% on Saturday, Sunday & Public holidays. Today, in the paper there is an article about the costs of staff going up in the restaurant and catering industry and the subsequent rise in prices we are about to experience. (Bitter Pill on the Menu, The Sunday Telegraph, 22 Feb 2009, pg 26) But one thing I know for sure: On a Saturday night, you DO NOT apply a surcharge. Thursday, Friday and Saturday are the busiest nights in the restaurant world. This surcharge bumped our bill significantly, and honestly, for no benefit to us as the consumers. We did not get better service, we did not get better food, and when you are paying close to $300 for a meal, you expect more. A lot more. So I wrote a note on the feedback form supplied with our bill. Now, who knows if they care about a note from some chick from over East, but I really do hope they pay attention as I’m sure that anyone who visits Perth from any other City in the world would find the lack of value startling. Aaah so this is the Saturday night surcharge place you were telling us about! That does add up quite a lot. I suppose then from their message that the staff don’t get the service charge and that it’s passed back onto management to cover their wages? That is not good for the staff or the diners. Exactly! That’s why I was fairly unimpressed. 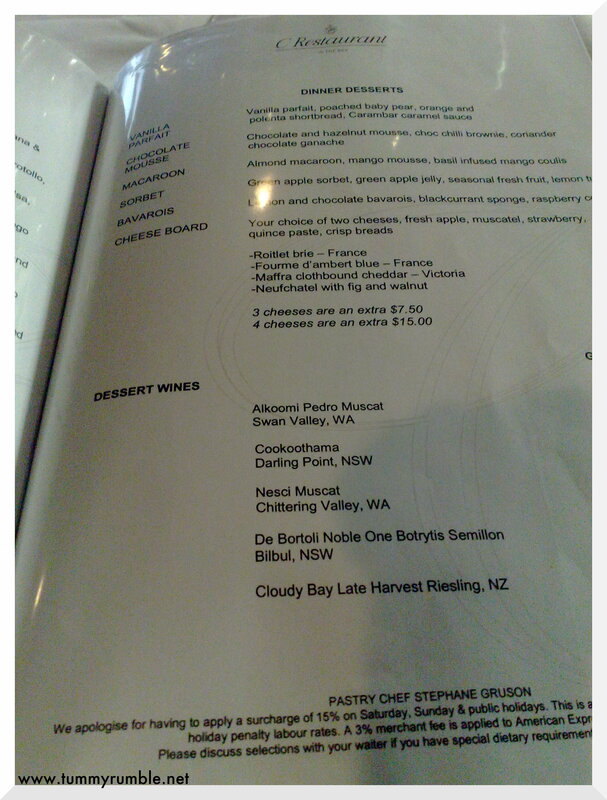 As a comparison, a degustation at Becasse with matching wine is $400 no surcharges…and that includes a $20 tip! 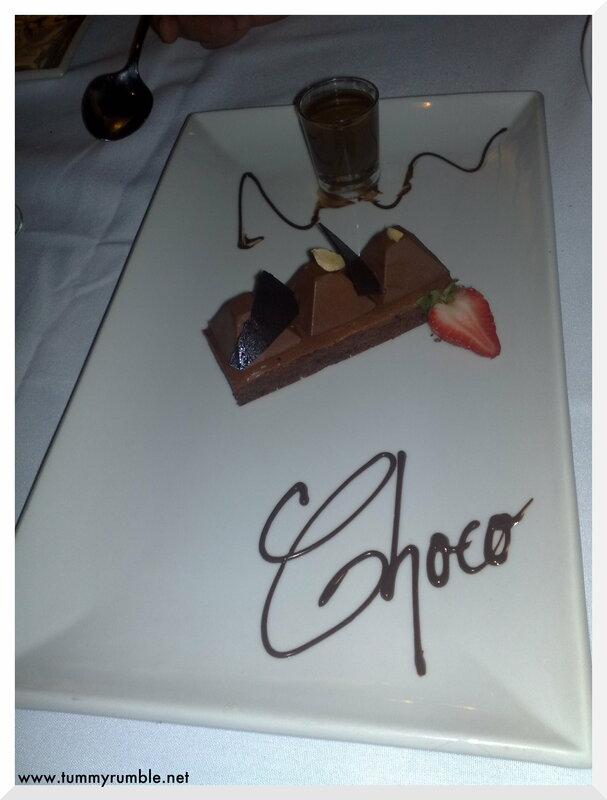 Cute presentation on the chocolate plate. Sounds like it was disappointing value though. @ Shez it was such a let down, especially as I think it’s meant to be a top celebratory/special occasion type restaurant! 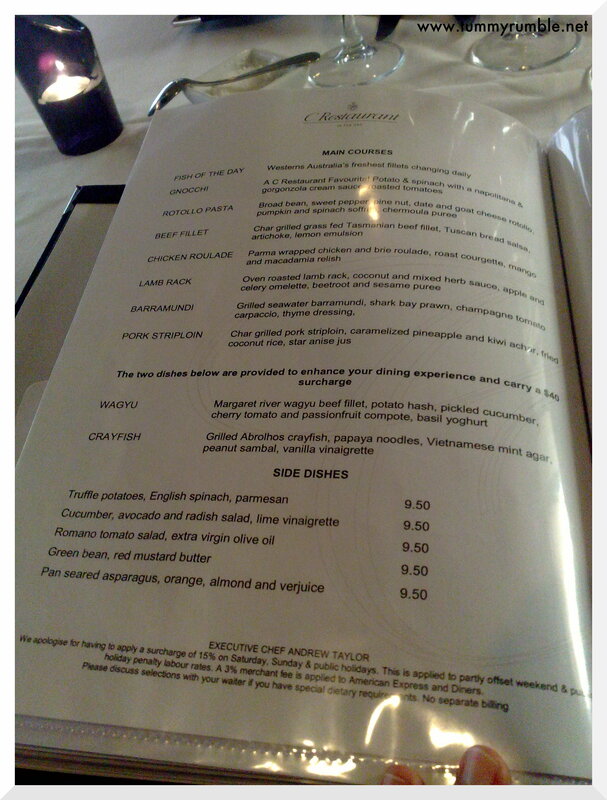 @ Arwen Compared to the amazing dinner I had at Subsolo the other night, and the fine diners here in Sydney? Value was terrible! This place is basically a joke among people in Perth who like food. I’m sorry you wasted one of your Perth nights at such a terrible spot! 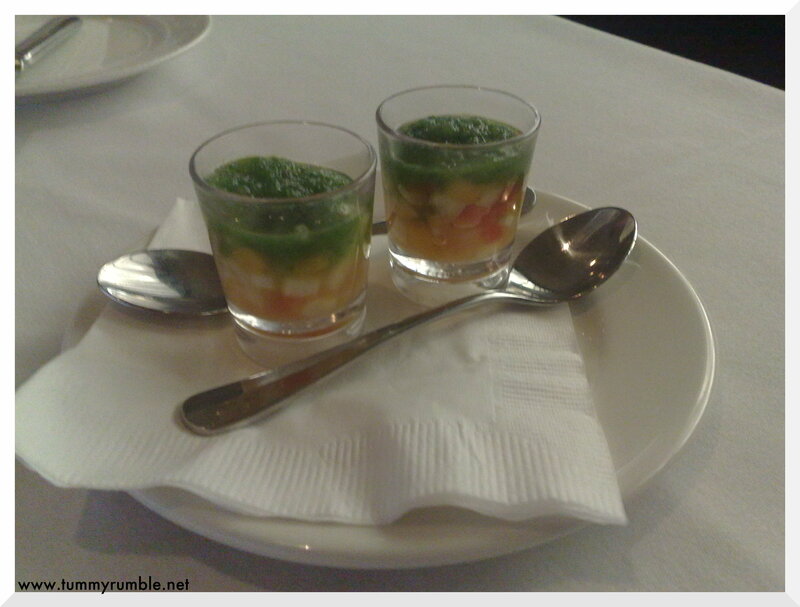 Next time (if you come back again), try Restaurant Amuse in East Perth or Star Anise in Shenton Park.